From the earliest days of the revolution, efforts to legitimize the Marxist Leninist project centered on free and universal healthcare and education. Real and/or reported achievements, aided by a tight control and manipulation of statistics, together with vigorous propaganda efforts worldwide have created an exceptionally favorable international opinion of Cuba’s universal health and education systems. Fidel Castro realized early on the value of health diplomacy as a tool to advance his goals internationally. The highest-ranking defector from Cuba’s Armed Forces, General Rafael del Pino, recalls how Fidel Castro explained “humanitarianism” as a political calculation; he was convinced that anyone given free education or medical attention would become an ally of the revolution; in the worst case, they would never become its enemy.1 From the initial success of a medical brigade sent to Algeria in 1960 and teams sent for disaster relief, Cuba began to “export” professionals, mostly in the field of health, for service in the developing world. The concept developed into establishing government-to-government agreements premised on sending Cuban health professionals to provide medical care worldwide at little or no cost to the recipients. It was strategically brilliant—while earning hard currency to advance the economic goals of the regime, they gain political influence, prestige, legitimacy, sympathy, and support for the Cuban revolution internationally. The Cuban government makes considerable efforts extolling the virtues of the medical brigades. Together with touching stories of the heroic efforts of the “soldiers of the revolution,” precise statistics are widely disseminated in international reports and media coverage of patients seen, consultations completed, deliveries performed, surgeries, etc. Although Cuban doctors report that statistics are systematically tampered with and many reports do not match up,5 there is no doubt that Cuban professionals have cared for large numbers of patients all over the world and particularly those in greatest need. That the missions have “saved millions of lives around the world” may be overstated, but that many lives have been saved and bettered is undeniable. The Cuban doctors, nurses and health technicians serve under government-to-government agreements. Well over 100 governments—nearly all in Latin America, the Caribbean, Africa and the Arab world—have signed cooperation pacts with Cuba for their sustained presence in their countries. This is no small feat for a small and poor country like Cuba and it usually leads to strengthening ties in other areas. The alliance with Venezuelan President Hugo Chávez has given Cuba’s health diplomacy a tremendous boost. In 2000, soon after Chávez was elected President, Cuba and Venezuela signed a cooperation agreement that established the basis for a growing economic and political alliance. In 2003, the “oil-fordoctors” program was launched, with Venezuela paying Cuba in whole or in part for its health “collaborators” working in Venezuela and other friendly states,6 particularly those within the framework of the Boliviarian Alternative (or Alliance) for the Americas (ALBA). 7 By joining forces to greatly expand medical treatment for traditionally underserved populations, Chávez and Castro found an effective formula to: (1) provide critical aid to Cuba’s ailing economy to keep the Castro regime in power; and (2) boost loyalty and support for their political agenda and revolutionary/ Marxist project. The presence of Cuban health “collaborators” in Venezuela grew rapidly and massively until 2008 under the aegis of the “Misión Barrio Adentro” (“In the neighborhood mission”), launched in 2003.8 By the end of 2007 there were 29,296 Cuban health professionals in Venezuela—of which 13,020 were doctors. 9 Venezuela also funded a very large vision restoration program, “Misión Milagro” (Operation Miracle), whereby Cuban eye specialists conducted surgeries on marginal populations especially from ALBA countries either by flying the patients to Cuba or by establishing eye clinics in their countries. Millions have been treated. These services have not been delivered by Cuba for “free,” as Fidel Castro and Cuban officials have publicly and historically insisted.10 In fact, Cuba generally receives payment.11 Examples abound in reports by media and official sources from many host countries. The exception has mostly been for the emergency relief brigades sent as assistance in response to natural disasters, although these often lead to a cooperation agreement involving payment. 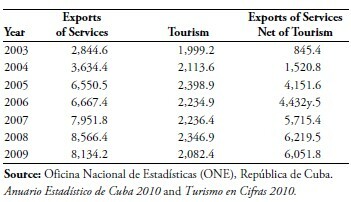 Cuba developed an increasing dependence on the export of professional services for GDP growth; export of professional services surpassed tourism revenues in 2005 and grew to three times tourism revenues by 2008. After the slowdown, “no substitute has been identified in other sectors of the economy, all of which have trailed behind with very low productivity.”18 The decline in hard currency revenue from services exports and the large corresponding deceleration in GDP compounded already serious economic difficulties and triggered a grave internal crisis. As a result, Cuba has doubled efforts to expand its health diplomacy beyond Venezuela. An all-out campaign to secure economic survival is at play. Cuba has been increasing the presence of health missions in many different countries. Reports have surfaced of larger or new brigades in the Englishspeaking Caribbean, Africa, the Arab world, and in oil-producing developing countries. Cuba’s efforts in Haiti after the January 2010 earthquake have been particularly noticeable and effective; its medical brigade has grown considerably, with substantial funding from other countries and international organizations. Plans for further expansion with massive international funding are underway. How is Cuba Fostering the Expansion of its Health Diplomacy? An international advocate of the Cuban internationalist effort explains: “Cubans, with the help of Venezuela, are currently educating more doctors, about 70,000 in all, than all the medical schools in the United States, which typically have somewhere between 64,000 to 68,000 students enrolled in their programs.”22 Considering the United States has a population 35 times as large as Cuba’s and a vastly larger GDP, this is quite extraordinary. It is probably possible only because the state is the sole employer of medical workers and has strict control over education, dictating what people should or may study. That doctors living in near poverty can earn a bit more abroad and use that to leave the country also helps. In June 2011, Cuba’s National Statistical Office reported that in 2010 overall employment in the health sector had fallen 14% from 330,000 in 2009 to around 282,000.24 The cuts corroborate persistent reports of a severe lack of medical personnel since the mid-2000s. Cuba’s official media portrays the internationalists as “soldiers of the revolution” in the most heroic of terms. There is no doubt that the Cuban health workers do much good in providing care to many of the world’s neediest, regardless of why or how that comes to be. But official reports are loaded with heavy-handed praise and devoid of any mention of aspects that might give pause. Many are relayed verbatim in the local media of host countries—and internationally—and with the help of host government officials. For example, promoting the false idea that Cuba provides the international health services for free is a key aspect of Cuba’s public relations efforts. Many host governments lend themselves to creating this impression by not correcting Cuba’s statements and help portray the Cuban government and the “cooperation” in the best of terms. The partnership with Cuba is very appealing to officials and politicians in many host countries because medical services are delivered at relatively low cost to the state and for free to typically underserved populations in areas where it is difficult or nearly impossible to send local doctors and international volunteers. Securing More International Assistance to Fund the Health Missions. The Cuban government has doubled efforts in recent years to increase financial assistance from international organizations and developed countries to fund its international medical missions in the developing world. It appears that nowhere has this been more successful than in Haiti. That some Cuban medical brigades receive funding from governments and international agencies and organizations is rarely even mentioned. Some of this aid is channeled through triangular cooperation with governments of developing countries and/or international NGOs. Examples include aid from Germany for missions in Honduras and Niger, Japan and France also for Honduras, and France, Japan, Norway and Brazil for the mission to Haiti.28 In 2004, South Africa donated US$1million as party to a trilateral agreement to deploy more than one hundred Cuban doctors in Mali and gave another US $1 million in 2010 to support thirty-one Cuban medical professionals in Rwanda for a year.29 WHO, the United Nations Children’s Fund (UNICEF) and the Pan American Health Organization (PAHO) have all funded Cuba’s medical education initiatives and services abroad.30 Cuba could be making considerable profits from some of the missions, given the very low compensation Cuban internationalist personnel receive but, because the agreements are not public, this aspect is unknown. Using Other Mechanisms of Health Cooperation as Building Blocks to Sending Medical Brigades. Cuba typically moves very quickly to deploy emergency brigades to countries that have suffered a natural disaster. In several cases, this has led to cooperation agreements, a larger and more permanent presence for Cuban medical personnel, and strengthened ties with the host country. Honduras after Hurricane Mitch in 1998, Pakistan after the 2005 earthquake, and Haiti after Hurricane Georges in 1998 and the 2010 earthquake serve as examples. Because Cuba’s government is the sole employer of medical services personnel in the island, it can send specialists at very short notice practically anywhere in the world and have them stay as long as it wishes and under the terms it dictates. The personal concerns of Cuban workers do not figure prominently—if at all—in this equation. This gives Cuba an edge that few can match. After two major natural disasters—a hurricane in 1998 and a devastating earthquake in 2010—Haiti has provided a perfect opportunity for Cuba to further its interests in a number of ways. Nowhere has Cuba’s strategy to expand its health diplomacy been more obvious and successful than in Haiti. News of extraordinary results of the health services the Cuban medical brigade was delivering in Haiti soon surfaced, although reports were inconsistent. In December 2003, Haiti’s Finance Minister said that “82% of all Haitians had been treated by a Cuban physician or health-care specialist.”40 Cuba’s permanent representative to the United Nations, in turn, reported that Cuban doctors were providing health care for 75% of the Haitian population and had “saved nearly 86,000 Haitian lives in the last five years.”41 Cuba’s Ambassador to Haiti reported in early 2004 that 705 Cuban “internationalists” were in Haiti, of which 579 were in the health sector, “most of them doctors, “who were working in 95% of Haiti’s 133 municipalities.42 By then, 628 Haitian doctors had also been trained by Cuban experts, both at a medical school in Haiti and in Cuba.43 Cuba-Haiti relations prospered. President Préval developed very close ties with Fidel Castro and traveled to Cuba several times, frequently praising Cuban medical assistance to Haiti. By 2007, PAHO reported remarkable improvements in Haiti’s health indicators.46 As usual, Cuba put out statistics documenting a gigantic number of health services delivered. Considering that Haiti had a population of around 8.5 million, from December 1998 to May of 2007, the Cuban medical brigade had saved 210,852 lives (in emergencies) and conducted 14.8 million visits (10,682,124 patient visits to doctors and 4,150,631 doctor visits to patients), 160,283 major and minor surgeries, and attendance at 86,633 births.47 Whether the numbers are accurate or not,48 there is no doubt that the presence of Cuba’s health workers was important as well as greatly appreciated by the Haitian population and its government. By June 2008, however, the number of Cuban health professionals in Haiti had declined to 48849 (from 579 in 2004). By January 2009 more health professionals had left, brining the number down to 344.50 No official explanation for the decline in number of physicians in Haiti has been found, but doctors were being pulled from their assignments overseas and sent to Venezuela,51 where the “Barrio Adentro” program was generating huge flows of revenue for Cuba. A press release by the Cuban Mission to the United Nations (in New York) put out very detailed data of the medical assistance to Haiti until the time of the earthquake. It claimed that since 1998 some 6,094 Cuban medical personnel had worked there and had reportedly delivered an extraordinary number of medical services—over 14.6 million consultations,52 207,000 surgical operations (including 45,000 vision restoration operations through their Operation Miracle programme53) and 103,000 deliveries/births. However, official Cuban reports conflict, so it is impossible to ascertain actual results in terms of services delivered.54 It was also reported that 917 Haitian professionals were formed in Cuba, 570 as doctors, and 660 others were studying in Cuba (541 in medical school).55 Five Comprehensive Diagnostic Centers “built by Cuba and Venezuela” were serving the Haitian population.56 Countries such as Venezuela, France, Japan and Taiwan, the WHO, PAHO and many NGOs had, by the earthquake, already provided substantial funds for different aspects of the Cuban health mission in Haiti. When a devastating earthquake struck Haiti at 9:53PM on January 12, 2010, 403 Cuban collaborators were in Haiti, 344 of them health professionals. They were working in 127 of 137 of the country’s municipalities (communes).57 Within the first 12 hours they treated 605 patients and within 24 hours performed 1,000 emergency surgeries.58 Cuba sent an emergency relief brigade immediately that grew in size over the following weeks. The brigade appears to have been composed mostly of students from ELAM in Cuba, Haitian doctors who had completed their studies there or had been trained by Cubans in Haiti (presumably already in Haiti) and rehabilitation specialists, physical therapists, and epidemiologists from Cuba. The U.S. based NGO MEDICC (Medical Education Cooperation with Cuba) put out a document in late July 2010 that emphasized: “While other emergency medical teams have transitioned out of the country, the Cuban-trained doctors from Haiti and 26 other countries continue to serve within the Cuban- led medical contingent, the largest in Haiti.” It reported that the following services had been delivered as of May 2: 341,241 patient consultations, 8,715 surgeries (3,849 major and 4,866 minor), 1,617 attended births, 111,250 persons vaccinated, 72,773 patients receiving rehabilitation services, and 121,405 children and youth receiving psychological services. It is hard to imagine how a contingent of around 1,000 persons (not all doctors) could have accomplished this in four months’ time. However, in thousands of academic and media sources consulted, a face-value reporting of the statistics provided by Cuban officials has been the norm; questioning the reliability or feasibility of data provided by Cuban officials or state-controlled news agencies and institutions is almost entirely lacking. In October 2010, a cholera epidemic began to ravage Haiti and eventually killed several thousand people. Cuba announced it would send 300 health professionals including transferring doctors posted in other countries.67 In January 2011, the Director General of the Haitian Health Ministry reported that Haiti had 100 cholera treatment centers, including several run exclusively by the Cuban brigade.68 How long they stayed is unclear, but in April 2011, at a Presidential Palace ceremony, Haitian President Préval awarded the National Order of Honor and Merit, the country’s top award, to Dr. Lorenzo Somarriba, chief of the Cuban Medical Mission in Haiti, in recognition of exceptional work in fighting the cholera epidemic. He highlighted the work of the Cuban brigade, which he said had 1,300 members at the height of the epidemic and served in “the most remote areas” of the country.69 News reports failed to mention that Norway had donated to Cuba 5 million Norwegian Crowns (US$850,000) for the cholera response. In December 2010, the Cuban Communist Party’s official newspaper, Granma, reported that the Cuban Brigade had 1,295 members: 515 doctors, 447 nurses, 244 technicians and 89 support medical personnel. 70 That same month, Cuba’s Vice Minister for Health put the number at 1,334.71 Just days later, on January 12, 2011, the head of the Cuban medical mission to Haiti said, that 720 health professionals were part of the Cuban Mission. He explained that 700 were from ELAM, so that the mission had representatives of 22 countries plus Cuba and Venezuela.72 In July of 2011, a Haitian source reported 410 doctors and 80 other health professionals from Cuba in Haiti.73 It appears that some of the conflicting numbers result from Cuba’s reporting of non-Cuban doctors graduated from Cuban medical schools and medical students as part of the disaster relief contingent, not of the cooperation agreement with Haiti. In April 2011, Michel Martelly was elected President of Haiti, bringing a less friendly disposition towards Cuban revolutionary ideology. It is too soon to tell if the change in political fortunes in Haiti has had any effect on the Cuban presence in Haiti. In the U.S., traditional Cuba supporters and antiembargo advocates went to work immediately and in chorus, securing exposure in major media outlets. Forty-two hours after the earthquake, the Director of the American Strategy Program at the New America Foundation was featured by CNN calling for U.S.- Cuba cooperation with Haiti. He argued that the devastation in Haiti provided a platform to move beyond the Cold War stasis in U.S.-Cuba relations and build confidence between Cuban and American authorities. 77 The following day, The Huffington Post published a piece by the Director of the Center for Democracy in the Americas titled “To Increase Help for Haiti, Obama Should Let U.S-Cuba Cooperation Take Flight.”78 Using as stepping stone the agreement on U.S. relief flights over Cuban airspace— announced just hours before—she called for on-the-ground cooperation with Cuba in Haiti, with the Cuban medical brigade serving as a foundation for broad Cuban-U.S. cooperation. The U.S., she said, could help expand the reach and impact of the Cuban medical brigades, offering as examples lending the Cubans durable medical equipment and using U.S. helicopters for transport to inaccessible locations. The balloon soon fizzled, but with no official explanations on either side. Among possible reasons, the Cuban government had unleashed a wave of internal repression after the February 23 death by hunger strike of political prisoner Orlando Zapata Tamayo.83 The international outcry against Cuba was growing and widespread; for the U.S., the timing may have been ill suited for a rapprochement. In the earthquake’s aftermath, Cuba’s health collaborators were credited for “providing free and disinterested” 84 services in Haiti amounting to a “contribution” of US$400 million since 1998.85 Lists of lives saved, consultations held, surgeries performed, etc., were continuously updated and made part of most news reports. Media sources disseminating Cuba’s claims have never caught on to the discrepancies in the figures and have almost exclusively echoed Cuban official reports. Haiti had been a fertile staging ground for Cuba to enter into trilateral agreements for third parties— international organizations or governments—to provide funding for Cuban medical brigades. Given the large historic levels of international assistance pouring into Haiti, it is not surprising that Cuba had been tapping into it for years. But, the earthquake provided grander opportunities. There are glimpses into Cuba’s seemingly outstanding success in developing this strategy. Thirteen days after the earthquake Hugo Chávez announced that an ALBA delegation would travel to Haiti to propose to President Préval a comprehensive plan for the health sector in the reconstruction of the country.94 It was soon clear from statements by Cuban officials that Cuba intended to take center stage. On February 23, Raúl Castro publicly confirmed that Cuba was “now focusing the mission on advancing Haiti’s long-term health system.”95 Very soon, plans were unveiled for a gigantic and costly endeavor designed to be run by Cubans and Cuban-trained medical staff at a cost of US$170 million per year. 101 primary health care centers were already under construction and the plan was to build 30 community referral hospitals equipped with state-of-the-art technology, 30 rehabilitation wards, and a National Tertiary Health Care Specialties Hospital. 80 high level Cuban specialists would work in the hospitals and would be in charge of clinical departments and services, research, teaching and training of the Haitian professionals who would progressively replace the Cuban professors. NGOs from different countries have also made considerable donations. Because there is no international clearinghouse for these funds, it is impossible to figure out how much money Cuba has raised in support of its brigade in Haiti. The California-based non profit MEDICC has two support programs for the Cuban medical mission in Haiti. After the earthquake, it raised over $250,000 from foundations, companies, and individual donors to support Cuba’s relief efforts.103 It has also teamed up with the Pittsburgh- based Global Links to ship material aid to health centers and hospitals where the Cuba brigade is working.104 Global Links has also, among other things, shipped nearly $50,000 of antibiotics and other medical supplies donated by the University of Pittsburgh Medical Center to the Cuban mission. By Fall 2010, the Canadian Network for Cuba had raised and sent $143,231.63 to an account established in Havana “to help fund the outstanding work” in Haiti of the Cuban-led medical team.”105 The nearly half a million dollars from just three NGOs may be just the tip of the iceberg. If reports are accurate, a large number of those serving in the Cuban brigade are medical students or recent graduates. 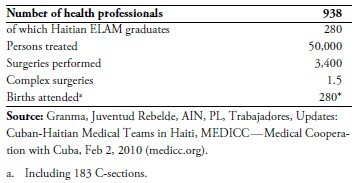 Haiti may have become an ideal practice location for ELAM’s students, especially because complaints are being heard from the Cuban population of inadequate care from foreign medical students and recent graduates forced upon them.109 Given concerns raised in different countries regarding the adequacy of training and the credentials of Cuban doctors, the question of qualifications would presumably be of interest to Haitian authorities charged with safeguarding even those desperately poor. No statistics or reports are available of what the actual cost of the Haiti missions might be for Cuba. It is impossible to determine how much Cuba might be deriving in net financial gain from the cooperation agreement with Haiti or if the additional relief contingent Cuba sent to resulted in net gains or losses. In 2006 the Cuban Ambassador to Haiti reported that Cuba was spending $520,000 a year for transporting its experts to Haiti, as “the Cubans themselves don’t receive salaries.”110 Given that this is contrary to what is known about the brigades, it is unclear what he was concealing or how Cuba was accounting for the donations received in trilateral arrangements. Transport between Cuba and Haiti is probably not very significant given the proximity of both islands to each other. Whether or not the Cuban “contribution” was accurately reported by the Ambassador, Cuba gets a lot of bang for its buck in terms of international legitimacy, support, and influence from its medical brigades. There is probably no better aid than what can be seen, touched, and felt, such as the care provided by doctors and nurses—especially so when a strong communications plan to exert maximum influence. As a point of comparison, since 1998, the U.S. has spent billions in direct government aid to Haiti, yet very little credit has been derived from it. It is not surprising, then, that many Cuban healthcare personnel welcome the opportunity to be part of foreign missions for material gain: the possibility of buying computers and electronics they cannot get in Cuba, to obtain the hard currency bonus for those who serve two years, to gather some savings, and to bring back to Cuba consumer goods at the end of the mission.113 Some see a foreign assignment as their only chance to leave the country. If Cuban health workers defect,123 they are considered “traitors,” their families are not allowed to leave to join them,124 and they may not obtain documents on their education and career track (it is punishable by law for any government worker in Cuba to deliver them). Questionable quality of healthcare and lack of accountability with repercussions for patients in host countries. The massive and accelerated training of health professionals for “export” raises concerns regarding quality. This has led medical associations in host countries to question their experience and credentials.127 Some “doctors” are sent abroad without completing the last two years of medical training. Malpractice allegations have surfaced in several countries, including Haiti, with little recourse for patients. Some countries—such as Panama, Honduras and Brazil- have terminated their cooperation agreements with Cuba and sent the Cuban internationalists back. Excessive external economic dependence by Cuba. Seventy-five percent of Cuba’s exports of services relate to exports of services by Cuban professionals, with limited multiplier effects in the economy. The large hard currency revenues derived from these services greatly diminish pressure to make badly needed structural economic reforms, including a dedication of resources to more stable and development-inducing productive activities. It has also made the Cuban economy extremely dependent on an external factor that could quickly disappear, for example if there were regime change in Cuba or Venezuela. 2. “Cuba to extend medical collaboration to 81 countries,” Granma International, April 1, 2008. From 1961 to mid-2011, 130,000 were reported to have worked in 102 countries. (Katelynn Northam, “The influence of Cuban medical internationalism— ‘Cooperation—not aid,’” Dalhouise University, July 15, 2011. http://www.dal.ca/news/2011/07/15/the-influence-of-cuban-medicalinternationalism. html). 4. Luis Hernández Serrano, “Médicos cubanos atienden a 70 millones de personas en el mundo,” 13 de abril de 2008, digital@jrebelde. cip.cu (in the page of the Cuban Ministry for Foreign Relations, Cuban Embassy in Egypt. http://emba.cubaminrex.cu/Default. aspx?tabid=16739). 7. Cuban officials and the Cuban media consistently report on the medical programs and international missions within the context of the ALBA. ALBA seeks the political, economic, and social integration of the Caribbean and Latin American countries in “an alternative model to neoliberalism,” essentially meaning Marxism-Leninism. ALBA countries are: Antigua and Barbuda, Dominica, Bolivia, Cuba, Ecuador, Honduras, Nicaragua, St. Vicente & Grenadines and Venezuela. 8. The “Misión Barrio Adentro” arose as part of the Integral Agreement of Cooperation between Cuba and Venezuela and began to operate formally on May 22, 2003, with the participation of 200 Cuban and 30 Venezuelan doctors and an initial investment of one billion Bolívares. Bolivarian Republic of Venezuela: Health Situation Analysis and Trends Summary, PAHO—Pan American Health Organization. http://www.paho.org/english/dd/ais/cp_862.htm. 9. 13,020 doctors, 2,938 odontologists, 4,170 nurses and 9,168 “health technicians” were serving in Venezuela. (“MinSalud desmiente a Provea: 30 mil médicos, odontólogos y técnicos cubanos están en Venezuela,” 10 diciembre 2008. http://www.radiomundial.com.ve/ yvke/noticia.php?t=16023). 10. According to Fidel Castro, by 2003, 52,000 doctors and health professionals had served “voluntarily and for free” in 93 countries. (“Los pueblos dirán la última palabra,” Versiones Taquigráficas, Consejo de Estado, “Cuba demanda sustitución de organismos financieros internacionales,” Prensa Latina, La Habana, 5 febrero 2003. Discurso pronunciado por el Comandante en Jefe Fidel Castro Ruz, Santiago de Cuba, 26 de julio del 2003. http://www.jrebelde.cubaweb.cu /2003/julio_septiembre/jul-27/lospueblos.html). 11. For example, in 2000, Cuba was receiving monthly revenues estimated at US$1.2 million from Zimbabwe and in 2007, South Africa was paying the Cuban government US$3,800 to $4,400 per month for each doctor. See Werlau, op.cit. 12. The author confirmed this with an economist from Cuba during his visits to New York City in 2010 and 2011. 13. Mary Anastasia O’Grady, “Venezuela’s Docs Flee—So Does Chávez,” The Wall Street Journal, July 18, 2011. 14. Calculation based on official 2008 and 2009 statistics from Cuba on the number of health professionals serving abroad and the amount of services exports. 15. PDVSA, the state-owned Venezuelan oil company, reported spending US$1.7 billion in 2006 and $3.3 billion in 2007 in the Barrio Adentro program, but only $130 million in 2008 and a mere $7 million in 2009. In 2010, there was a reported increase to $650 million, however, this was far below the 2006 and 2007 levels, when Cuba was reporting a bonanza in export services. It is unclear how much this number reflects payments to Cuba, but no doubt the declining investment of resources in the program is evident. (Aportes realizados por PDVSA al Desarrollo Social, Desarrollo Social PDVESA, 2010, http://www.pdvsa.com/interface.sp/database/fichero/free/ 6770/1399.PDF). 16. Louise Egan, “Chavez’s socialist medicine dream may be liability,” Caracas, Reuters, August 18, 2011. 17. Simon Romero, “Chávez Says China to Lend Venezuela $20 Billion,” The New York Times, April 18, 2010; Ian James, “Hugo Chavez: China granting Venezuela $4B loan,” Associated Press, July 9, 2011. 19. Pablo Bachelet, “U.S. program for defecting Cuban doctors a success,” The Miami Herald, March 11, 2007. 21. “Medicina: Cambios en el sistema de Salud de la Isla,” CubaEncuentro.com, 4 Diciembre 2010. 23. “Medicina: Cambios en el sistema de Salud de la Isla,”op.cit. Brouwer, op.cit. 27. Julie Feinsilver,”Fifty Years of Cuba’s Medical Diplomacy: From Idealism to Pragmatism,” Cuban Studies (2010). 29. Fiensilver, “Fifty Years of Cuban Medical Diplomacy,” op.cit. 30. Feinsilver, “Cuban Medical Diplomacy,” op.cit. 33. “Medicina: Cambios en el sistema,” op.cit. (citing data published by Cuba’s Health Ministry). 34. “Escuela Latinoamericana de Cuba graduó 10.000 médicos de 60 países desde 2005,” La Habana, EFE, 28 July 2011. 35. Conner Gorry, MEDICC Review, Summer 2008, Vol 10, No 3. 36. “Cuban Doctors to Haiti,” Caribbean Update, May 1, 1996. 37. Most countries in Latin America and the Caribbean had cut diplomatic relations with Cuba in the early 1960s in reaction to Cuba’s hemispheric subversion and internal human rights violations. In 1962 Haiti had cast the decisive vote excluding Cuba from the Organization of American States. Diplomatic ties between Cuba and Haiti had been re-established in February 1996, as the last official act of former President Jean-Bertrand Aristide. This was considered a snub to the United States (in 1994 the U.S. had sent 20,000 troops to Haiti to oust a military dictatorship and restore Aristide to power after a coup). With the normalization of relations, a process of growing friendship began. 38. Michael Norton, “Cuba sending doctors to Haiti in first Cuban-Haitian accord in 36 years,” Port Au Prince, Haiti, Associated Press, November 13, 1998. 40. Larry Luxner, “Cuba sends 705 doctors, teachers to impoverished Haiti,” CubaNews, December 1, 2003. 41. Citing Cuban representative to the U.N. Orlando Requeijo, at a U.N. press conference in New York (W. Steif, “Cuban Doctors Aid Strife-Torn Haiti,” The State, April 26, 2004. op.cit.). 44. Dr. Joel de la Torre, interviewed in Miami, February 1, 2011. 45. Feinsilver, “Cuban Medical Diplomacy,” op.cit. 47. Kirk & Kirk, op.cit. 49. Gorry, op.cit. Table 1: Cuban Health Professionals Serving Abroad, June 2008. 50. “Fact Sheet: Cuban Medical Cooperation with Haiti, Medical Cooperation with Cuba,” January 15, 2009 http://www.medicc.org/ ns/index.php?s=104>. 52. Curiously, this number is lower than the 14.8 million consultations reported above through to May 2007. 53. The Operation Miracle program has been reportedly fully funded by Venezuela. See Werlau, op.cit. 55. “Llama Cuba en la ONU a la cooperación internacional por Haití,” Cuba Debate, 18 de enero de 2010, www.cubadebate.cu. 57. Updates, MEDICC, op.cit. using as sources Agencia Cubana de Noticias, Granma, Juventud Rebelde. 58. John Burnett, “Cuban Doctors Unsung Heroes of Haitian Earthquake, ”National Public Radio report, January 24, 2010. 59. Tom Fawthrop,“Cuba’s aid ignored by the media?,” Havana, Al Jazeera, 16 February 2010. 60. Vito Echevarría, “Cuban medics offer a lifeline to Haitian quake victims,” CubaNews, February 1, 2010. 62. Nick Miroff, “Cuban Doctors in Haiti,” Boise Weekly, February 17, 2010. 68. Frances Robles, “Cuban doctors are on the rural frontlines in Haiti’s cholera epidemic,” The Miami Herald, March 3, 2011. 69. “Presidente haitiano condecora a la Brigada Médica cubana,”Juventud Rebelde, 21 de Abril del 2011. 70. Juan Diego Nusa Peñalver, “New Henry Reeve Brigade arrives in Haiti,” Granma International, December 23, 2010. 71. “Cuban Doctors Save 250000 people in Haiti,” Havana, Cuban News Agency, December 29, 2010. 72. “Médicos cubanos continúan fortaleciendo sistema de salud de Haití a un año del sismo,” Telesur, 12 enero 2011. 73. Stanley Lucas (Chairman, Haitian Coalition and Co-Chair, Greater Washington Haiti Relief Commission), by telephone, July 22, 2011. 74. “Cuba dispuesta a trabajar con Estados Unidos en apoyo a la devastada Haití,” Mesa Redonda, 15 enero 2010 (mesaredonda.cubadebate. cu). 75. David Jackson, “Obama government deals with Cuba over Haiti relief,” USA Today, January 15, 2010. 77. Steve Clemons, “U.S. and Cuba should work together to help Haiti,” Special to CNN, January 14, 2010 4:17 p.m. EST. 78. Sarah Stephens, The Huffington Post, January 15, 2010 03:55 PM. 79. Llama Cuba en la ONU…, op.cit. 80. Juan Tamayo, “U.S. offers Cuba medical supplies for Haiti,” The Miami Herald, January 25, 2010. 82. Paul Haven, “Top Cuban, U.S. officials meet,” Associated Press, April 2, 2010. 83. News coverage was extensive. See, for example: “Cuban prison hunger striker dies,” BBC News, February 24, 2010. 84. “Llama Cuba en la ONU,” op.cit. 85. Cuba’s Foreign Minister stated that medical services provided by Cuba in Haiti were “valued at” US $400 million. (“Statement made by Mr. Bruno Rodríguez Parrilla,” op.cit.) However, other sources report it as money spent and donated by Cuba in its mission to Haiti. (See, for example, “Cuba for Haiti Fundraising Campaign,” The Newsletter of the Canadian Network on Cuba, Issue 3, Fall 2010, www.canadiannetworkoncuba.ca). 86. “Health Organizations Praises Cuban Doctors’ Assistance to Haiti,” Cuban News Agency, May 28, 2010. 87. “PAHO Calls Nations to Follow Cuba’s Example,” Cuban News Agency, May 31, 2010. 88. “Cuban Medical Aid to Haiti Highlighted at the UN,”IPR Strategic Business Information Database, December 6, 2010. 90. Examples abound in the media and in academic circles. See, for example, “Cuba: Decries Silence of European Media on Help to Haiti,” IPR Strategic Business Information Database, December 6, 2010. 91. Translated from “Acuerdo de Cooperación Humanitaria entre Cuba y Noruega e Implementación del Donativo Noruego Como Ayuda de Emergencia a Haiti,” text of the agreement provided to the author by the Norwegian government, via email, September 20, 2011. 92. “Norway gives NOK 5 million for medicines and equipment in Haiti,” M2 Presswire, October 29, 2010. 93. “Cuba y Noruega firman acuerdos en los sectores del petróleo y la pesca,” La Habana, EFE, 17 mayo 2011. 94. “ALBA aprueba proyecto integral de ayuda a Haití,” 25 enero 2010, www.escambray.cu. 95. “Cuban docs expand Haiti coverage,” CubaNews, March 1, 2010. 96. “Statement by Mr. Bruno Rodríguez Parrilla,” op.cit. 97. “ALBA aprueba proyecto integral de ayuda a Haití,” op.cit. 99. “Cuban Doctors Save 250,000 People in Haiti,” op.cit. 101. Venezuelanalysis.com, July 21, 2011, citing Steve Brouwer, Revolutionary Doctors: How Venezuela and Cuba Are Changing the World’s Conception of Health Care, New York: Monthly Review Press, 2011. 105. “Cuba for Haiti Fundraising Campaign,” The Newsletter of the Canadian Network on Cuba, Issue 3 – Fall 2010 (www.canadiannetworkoncuba. ca). 107. Oil alliance of Venezuela with nations of the Caribbean for the sale of Venezuelan oil at preferential terms. Haiti is a member. 109. An independent news report from the island states: “The majority of Cubans do not accept the imposition of newly graduated foreign doctors at the emergency wards. What’s more, they will not resign themselves to serve as guinea pigs.” (Translated from Spanish from: Augusto César San Martin, “Demasiados médicos extranjeros,” La Habana, Primavera Digital, 28 de Junio de 2011. www.primaveradigital. com). 111. Article 216 of Cuba’s Penal Code (Ley No. 62 of 29/12/1987) forbids citizens from leaving the country without government permission and punishes attempts to do so with one to three years of prison. 114. Many of these rules are spelled out in a hand-out given to each health worker titled “Disciplinary Rules for Doctors in Venezuela (Cuban Medical Collaboration with the Bolivarian Republic of Venezuela),” Copy obtained from a deserting doctor. 115. “Disciplinary Rules for Doctors in Venezuela,” op.cit. 117. Internationalists had been allowed to send home 3 large boxes per year free of shipping costs and import duties (allowing their families to obtain electronics and consumer goods impossible to get domestically), but this benefit was suspended in 2010. 118. Gabriel Thimothe, Director General of the Haitian Health Ministry, told The Miami Herald in 2011 that the Cubans served in inaccessible areas. (Robles, op.cit.). 120. Dr. Joel de la Torre, op.cit. 121. Dr. Joel de la Torre, op.cit. 124. Many doctors who defected and are living in the U.S. reported to the autor that they have wives and children in Cuba who are not allowed out of the country to join them despite having entry visas to the U.S. The defecting doctors are also not allowed to enter Cuba. Many have not seen their families for years and have missed critical years of their children’s lives. 125. Lucas, by telephone, April 23, 2010. 126. This section draws on Werlau, op.cit. Details and sources are given in that earlier work. 128. The bibliography on this topic is extensive. See www.CubaNet.org for almost daily reports from Cuba as well as the section “Selective Humanitarianism” in Werlau, op.cit.